LIFESAVERS from the top surf boat crews in Australia raised their oars on the weekend in tribute to one of the Coast's most humble achievers, Bard Claffey. The Maroochydore Life Saving Club life member was honoured at the Aussie titles by the surf lifesaving movement for a contribution which spanned decades. 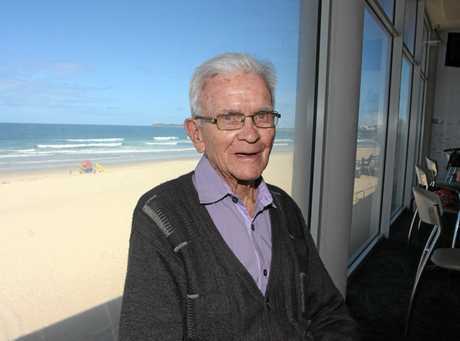 Surf Life Saving Queensland president Ralph Devlin said Bard was a passionate lifesaver who was a pioneer of the lifesaving movement on the Coast. "Bard Claffey was the architect of the 1980 Australian Surf Life Saving Championships here on this beach," Mr Devlin told those gathered. It was a championship which pioneered the surf boat championships of Australia in a central arena, he said. "In that regard Bard was the inspiration and… the architect of that." Mr Claffey was also the prime mover behind the Just Jean surf classic held between 1977 and 2000 on the Sunshine Coast. Surf boat rowing was also a central part of that exciting series on the Maroochydore Beach. Mr Claffey passed away last Monday, aged 90, just after the Aussies returned to his beloved beach. "He will be remembered as a thorough gentleman, passionate lifesaver, genuine clubman and one of the true believers of our great association." A Day at The Aussies: A video postcard of a day at the Australian Championships.